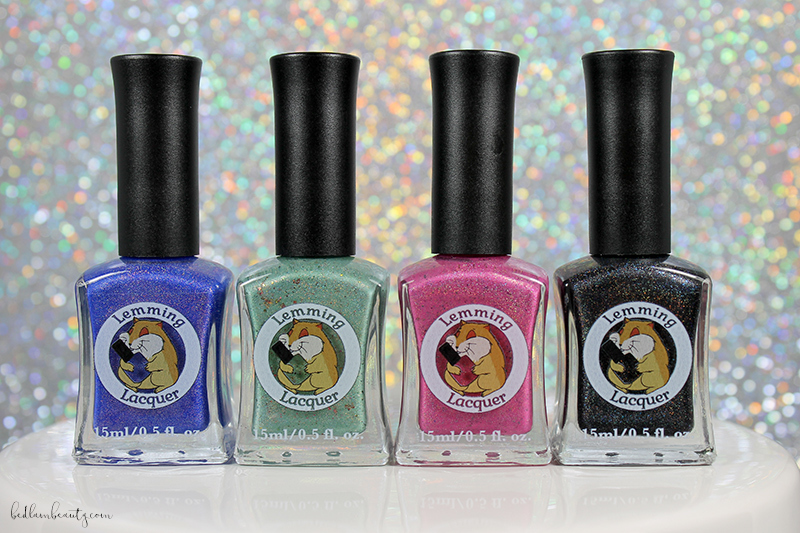 Lemming Lacquer is getting ready to celebrate an anniversary. Lucky for us the first anniversary for the glittering brand happens to coincide with an addition to the Curiosities From Wonderland collection. 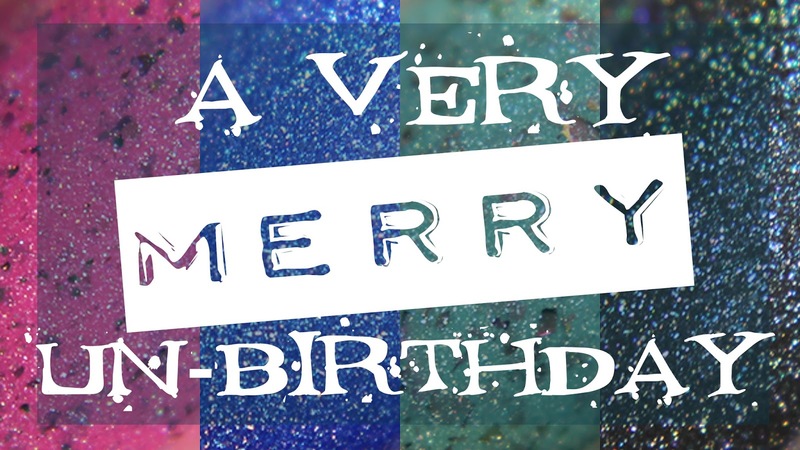 Keep on scrolling to see all the shiny things! This is a faded raspberry/vivid rose holotastrophe...in the best way. It has a nice holo rainbow with that goldy flash coupled with dense multichrome flakes. It is the SFW pink with a twist. My youngest thinks it looks like donut frosting...which I think it a good thing? I really enjoyed this shade, and it was pretty nice to apply. I used two coats plus a layer of Seche Vite for the pictures below...and omg there was sunshine! 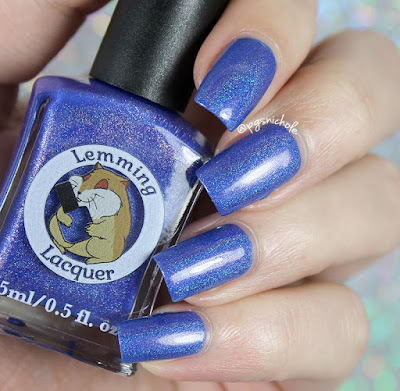 If the name of this polish doesn't send a shiver down your spine, I don't know if we can be friends. This shade is a cozy pistachio holo filled with multichrome flakes. This one was a surprise favorite for me, because I generally don't love warmer greens against my lobster claws pink-leaning skin. The formula, again, was spot on. Two coats, Seche Vite, and I was ready for action. Annnd by action, of course, I mean Netflix and coffee. This sucker is a sneaky cobalt holo that has tiny red flakes and I possibly hallucinated saw a bronzey shift at certain angles, especially in the sunshine. The base color reminds me a lot of Pacific Blue, which I love about shades like this. The formula is superb for this one, and it was perfectly opaque in two thin coats. If you have shorter nails, you may be able to get away with one medium coat. I used two plus a layer of Seche Vite for these pictures. Because who doesn't want something dark and mysterious in the sprummertime? This is not a black holo. It is a deep, soft charcoal that is dusted with tiny indigo flakes underneath the holo rainbow. I love colors like this in the warmer months. They always feel like a resting place in a sea of bright pastels and neons. The formula for this one was lovely, and it was another two-coater for me. This collection will be available from the shop on May 20th at 7pm central-time. In addition to these lovely shades, there are also some pretty awesome mani bombs in some delightful scents that are definitely worth checking out. After you buy your fill, why not check out the fan-group too? Beware the Jabberwock is a clear favorite for me here! :) Looks great on you! I love Lemming Lacquer and the Alice in Wonderland theme! This is a great anniversary collection. I love Beware the Jabberwock and Frabjois Day. I've never used this brand before - they are all so lovely! Nothing Was Ever Accomplished with Tears is my fave. That is my kind of polish. Oh my, Beware the Jabberwock and Nothing Was Ever Accomplished With Tears are amazing! Ooh Beware of the Jabberwock needs to be mine! 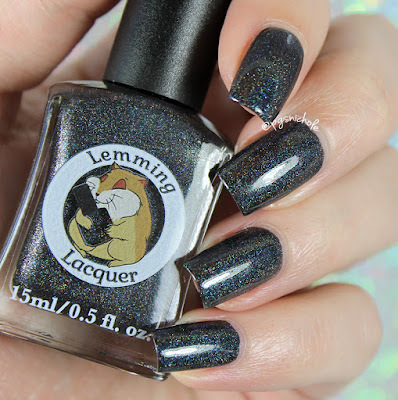 Lemming is one of my new favourites. So hard to pick a favorite! I love all 4, but the last 2 I think are my top picks! Beautiful shots of these! These are all so gorgeous where do I even start. I think for spring I am obsessed with green for some reason. The Beware the Jabberwock is gorgeous!! Oh wow! This collection looks amazing, all of it! My picks would be the first two shades with those extra flakes, because I know I have nothing like that. Whole collection is beautiful but the Frabjois is awesome. Wow what a gorgeous collection!!! I loooooove Beware the Jabberwocky!! I need Beware the Jabberwock!! That is freaking gorgeous! I love them all. Not going to try to pick one! Oooh, I want them! They are not in the shop yet - any word on when they are available? I think Wrath of Time is my favorite! I really love all of them, such beautiful shades with a twist! Jabberwock especially is one-of-a-kind! 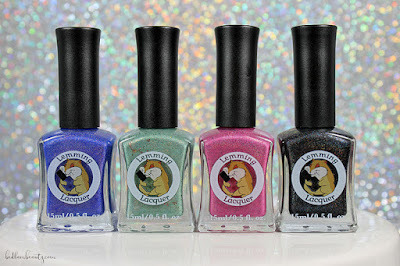 These are such fun polish names! Beware the Jabberwock is my favorite from the bunch.